Imagine a Chardonnay with no butter, no vanilla and no cream. Forget lattes, cappuccinos and all the creamy business… we just want black coffee. For those who've elevated their wine tasting chops to something beyond milk fat, unoaked Chardonnay sounds pretty compelling. There's a couple of other things that make unoaked Chardonnay delicious, sustainable and even technically more affordable than the oaked version. Unoaked Chardonnay was popularized by Chablis, a region about 80 miles Northwest of Dijon, France in Burgundy. Since the wines from Chablis traditionally are made with stainless steel, concrete or neutral oak, they do not have the butter-cream style. Chablis popularized this style and soon everyone around the world started labeling their no-oak Chardonnays with the word "Chablis" until France complained. Unoaked Chardonnay tastes only of the varietal characteristics of Chardonnay which are green apple, lemon and sometimes pineapple with a long tingly finish. 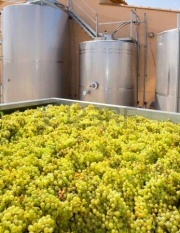 Unoaked Chardonnay is cheaper to produce. Yep. It's true. Take out the cost of paying for and shipping new oak barrels all over the world, year in and year out, and winemakers have a cheaper long-term solution. Thus, a lot of unoaked wines tend to fly into the marketplace at a much more affordable price point (and more sustainable).